I find that any Dollar Tree store is a plethora of unknown candies that I never find in the big box stores. I just love the variety of candies they offer. So, when shopping there recently, my youngest son, who is CRAZY into sharks right now, says â€œMAMA!!!! 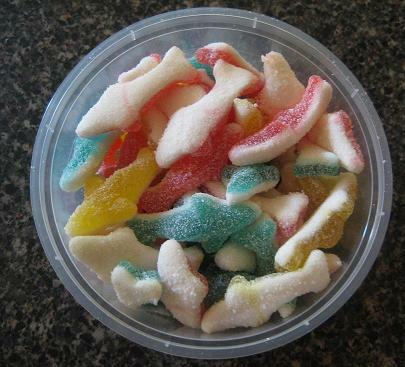 Look, shark candy!! Please! !â€ How could I say no? Especially when itâ€™s only $1? You can tell I said yes by the fact that they are now on my kitchen counter in the photo. 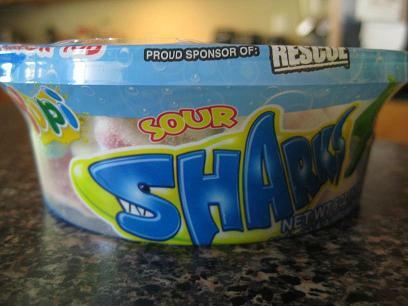 The tub is packed to the top with the gummy sharks, so right off the bat Iâ€™ve gotten my moneyâ€™s worth. They come in three flavors/colors: yellow, which tastes like lemon; red, which resembles a cherry flavor; and blue, which tastes like blue raspberry. Now, for the diehard sour Candy Addict, these are going to be disappointing. They are just a little bit sour. Me, I like my sour. If it doesnâ€™t get me to make my Popeye face, itâ€™s not sour enough (yes, when eating anything extremely sour, my face scrunches up and my right eye closes involuntarily, giving me a Popeye-like appearance). However, for those who prefer to dabble in the slightly sour, then these are for you. They have a nice gummy texture, not too chewy and not too soft and they have a good sugary coating on top and a white layer on the bottom. Each piece measures a little under 2 inches long. Flavor-wise, they donâ€™t provide any â€œflavor explosionâ€ or anything, just nice subtle hints of each flavor. The packaging touts that they are â€œbursting with natural fruit juiceâ€, but that juice is apple and is the 4th ingredient in the list. Not exactly â€œburstingâ€ when you bite into one, but it doesnâ€™t take anything away from the flavor of the gummy. All in all, if youâ€™ve got a dollar to spend and just want something decently fruity, then these are a good choice. If youâ€™re looking for seriously sour gummies, then these are not the candy for you. I personally donâ€™t think these are the greatest sour gummies out there but if I’m in the mood for something fruity and I’ve got $1 to blow, I’d buy these again.